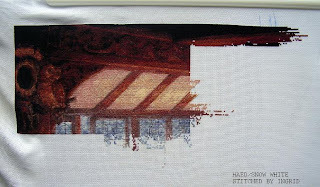 I can see the Tower....Now that I've started on page 3 . I haven't worked on this nearly enough There always seems to be something Else I need to do, but last week I manged a 3 day stint and that seemed to move it along. 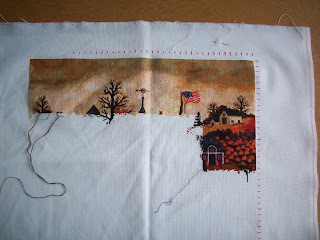 My blogger is still going crasy and I can only comment when it decides..But I've been watching the progress and I must say all of the stitching being done is awesome. I'm so proud to be in amongst all of you wonderful stitchers. Stitch with happy fingers and see you again soon. 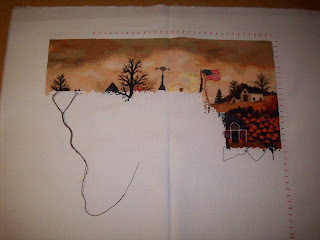 I have been stitching on Thursdays, even though i haven't managed to post updates. 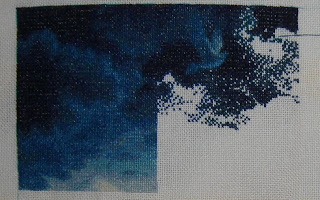 I've been working on Calming the Tempest- the border is taking a lot longer than I had anticipated- progress is very slow! Marie wrote me and said she wanted to offer a giveaway for January!!! Winner of the drawing will win their choice of a chart from HAED (any chart, you choose). THANK YOU SO MUCH MARIE FOR THIS AWESOME SURPRISE!!! 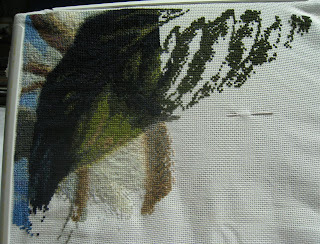 And fortunately I'm making a slow but steady progress with the Unicorn as well, I'm done with half of the second page. 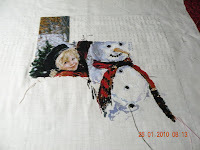 Well I hate to say it but this month I haven't done a great deal of HAED stitching! I have tried but the course of antibiotics I had before Christmas have messed with my stomach so I have been back and forth to the doctor's and am now almost finished my third course of antibiotics! It looks a bit washed out and with loads of white showing through but that's just because of the flash it really doesn't look that bad. I have to also show you my DD Jennifer's new start her third HAED!!!! 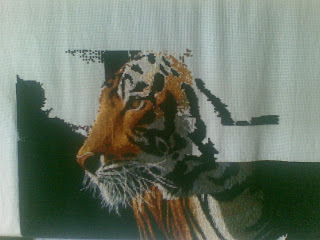 This one is Sarah Butcher's ACEO Leo ...Jennifer's stitching it for her sister's birthday in August and has already put quite a lot of work in. pic above and has started working on the hair and face now. Woo hoo!!! I have completed 7 out of 16 pages of Dragon Knot!!!! 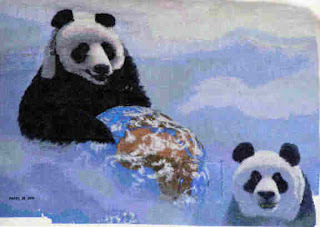 Here is the latest progress of my Pandas. 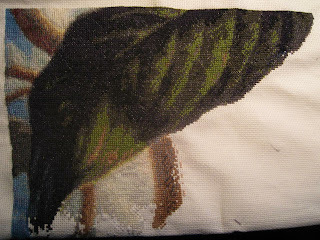 They are finished now and pretty soon the forest will begin as soon as I get all the clouds done. They are going quite well and I have made pretty good progress. 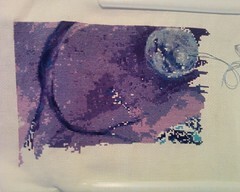 It has rained here for the last week so I have gotten a lot of stitching done. Hello everybody. Hope you had a great New Years. Here's my January update of Witching Hour. Progress is so sloooow because I can only stitch some on weekends. It's watching all the gorgeous work you post that is keeping me motivated. Maybe by 2010 I'll actually make it to the cat in the picture, LOL! So sorry I haven't posted for such a long time. I've still been struggling to find my stitching bug but after a lot of thought and chats with other stitchers this week I think I am finally turning a corner and know where I want my stitching to go. I've worked a little on my Moon Fantasy Storykeep and Cabin In The Woods but not much progress to show I'm afraid. Cabin was still on the qsnaps for this photo so you can't see the pages already completed. I will take a pic of the whole thing next time I update. At the moment Cabin is calling to me the most so I'm going to give that some attention and see if I can actually make some progress on it. I love this design SO much and really want it finished and on the wall one day, but the blues just seem to be going on forever. 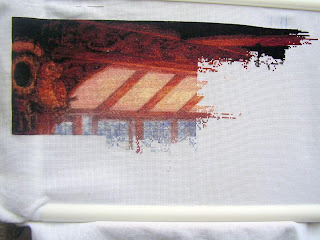 I have decided when I eventually finish this page I am going to move down and do another page with the cabin itself on for some excitement lol. It was my birthday a couple of weeks ago and I was lucky enough to receive a wonderful present of the new QS Garnet by Rachel Anderson which I am hoping to stitch in HDF silks. A very kind soul is doing the conversion for me and once I have that I will start saving to get the silks. I think at the moment I'm going to get the first 20 or 30 so that I can at least make a start on her, then get the rest bit by bit as and when I can afford. So hopefully I will have some pics of her to share soon. Second row is almost finished! I'm really enjoying to read this blog. Almost every day I check up what's new in here. Such a wonderful progresses you have done. My own work is moving on quite fast now. I found some motivation to finish my second row. Page 11 is finished finally (it took me really long time) Now I'm working page 12 witch is last page in this row and also smaller than other ones. 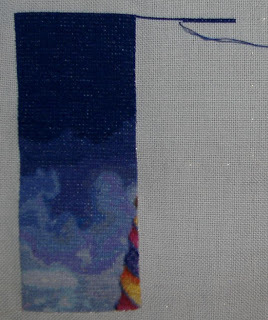 Few thousand stitches and sky is done (only Kreinik is left now). 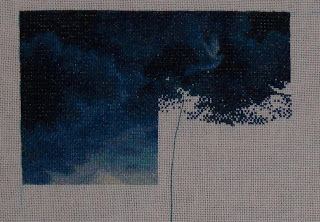 After that I will celebrate because it has been really frustrating to stitch 6 pages blue sky. And some mountains to do also, but I'm hoping to manage that promptly. Around 30 % is ready now. Huh. I haven't touch my Astronomer many weeks now, but that's OK. My priority is finish The Encounter first, so I don't take any pressure about moving on Astronomer. 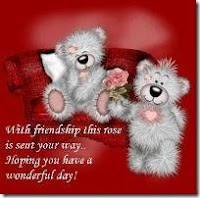 Have a nice stitching week and SAL my friends! I know I haven't been here or very supportive in the last few weeks. :-( I do look at your progress pics and think "WOW!" and then feel like I'm not getting anything done on mine. Here is my next progress pic of the HAED BB's SK SAL, Mermaid of the Deep. I was very happy to see this morning, in the natural light, that you can actually see the difference between 310 and the ultra very dark navy blue! Wishing everyone a happy, stitchy week! 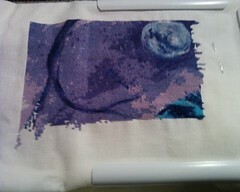 I started with "Touched by Magic" by Scott Gustafson, many shades of blue but I have some variety with a little color! The yellow color become a window and then back blue .... blue ... blue! 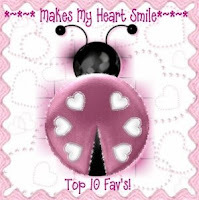 I like to see your beautiful work and thanks for sharing! Sorry I have been MIA for the last couple of months. I got sidelined by my Chatelaine, and managed to finish all the stitching on it, so now it is time to go back to my rotation. I finished pages 24 and 29, and now have 2 whole pages and 2 partial pages left. I will definitely see this one finished this year! Everyone's progress is so beautiful-I love seeing all the updates. I will be around more I promise! Just a quick note to tell everyone what beautiful work you are doing...Blogger won't let me comment so this will cover everyone!! Here is my latest progress on Peacock Lagoon. I am getting tired of all this blue. How much sky is there and how many shades of blue can there possibly be!!! Maybe, someday, I will finish page one!!! 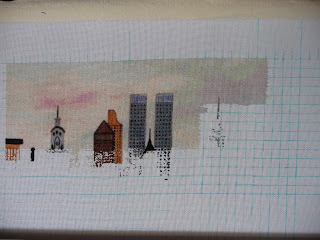 Finally I found the time to work on Manhattan Wonderland again. And as always enjoying it. Page 4 half done and I will keep this one my main focus for the rest of the week. Hopefully I'll can finish that page off. As you probably already know it, my favourite artist is Kinuko Craft. A few weeks ago, I felt captivated by one of her wonderful artwork : Elfland. 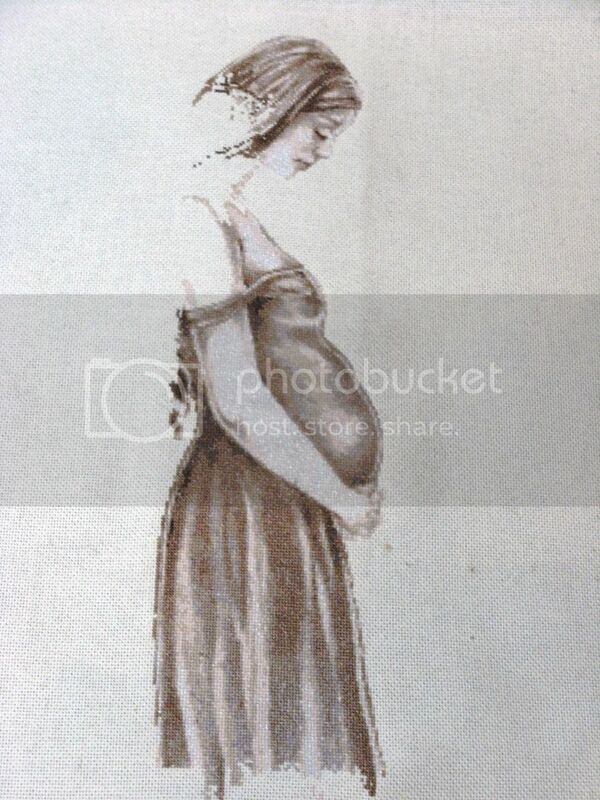 It was not the first time that I saw this painting, but it suddenly took sense for me. I was in communion with the atmosphere and all the details. That's why I'm diving into this journey with my needle. And I must say that I'm totally fascinated during stitching it. Although I haven't finished the first page yet, I wanted to share my work with you. 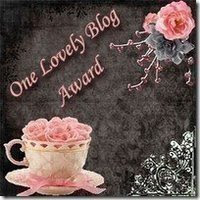 And, to finish my post, let me wish you all, a good luck for the giveaway ! I have been working on Linda Ravenscroft's Red Witch for my rotation. It is now 70% complete. 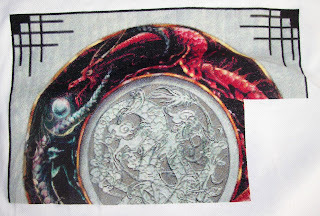 This was the design which first brought me to HAED designs and it is my focus HAED for 2010. WHO-HOOO!! Small happy dance going on here at my house tonight. I finished page 2 of 49 on Faery tales!! This one page took an entire skein of DMC 939. I am just curious on how much it will take to finish the whole project. Now I am trying to decide if I want to move to page 3 and stitch the Bean Stalk or I could move to page 10 (goes under page 1) to stitch Cinderella and her prince dancing. Decisions, Descisions. Love your stitching, I almost pop in every day to see if something new is here to read and admire! After more than a year of working on this one, I finally finished page 2. I don't work on Chessie that often, just here and there, but I decided to finally get all of those confetti stitches done. I probably will go back to Wrath for now but Chessie will come back again soon. Keep up the terrific work everyone! Finaly I finished the Middle piece of the Madonna. There were no more ours in a day to stitch. Now I am back at the Sifter from Williams. I peaked at everybodys work between job's. It is Gorgeous what everybody is doing !!!! Hello everyone, my mother is sick ...... and I am many hours in the home and I can also occasionally make some stitches, so I started this yet, I know am addicted to .... Haed patterns but they make me quiet for the moment. Hi friends , here's a up date of snow wihte, I stitched quite a lot but my progress is barely visible.Lots of color changes and confetty's but oh so fun to do! Snow White was my first Haed and I am still addicted .... he is still my favorite ! 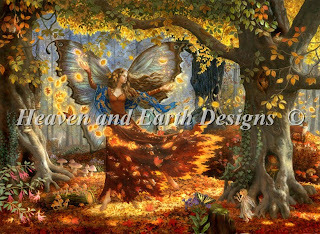 I have been working on faery tales the past couple of days. I am almost finished with page 2. 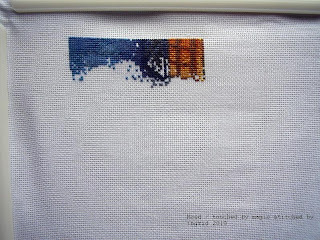 However, as you can see there is still a lot to be stitched...The good news is that the rest of page 2 must be stitched using DMC 939- navy blue. 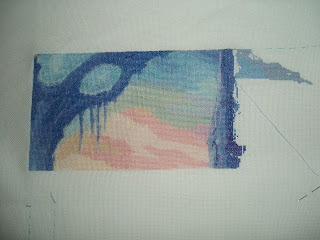 Who knows, this page might go faster if I only have one color to stitch. Update from My Buddy, Valerie J. Wrath - First Row Completed! !